We’d love your help. Let us know what’s wrong with this preview of McQueen's Machines by Matt Stone. To ask other readers questions about McQueen's Machines, please sign up. This is quite an interesting book. It mainly covers four different things, Steve McQueen's personal vehicles, his movie vehicles, his racing vehicles and his motorcycles. Because it covers so much it is not terribly in depth but the author does suggest an number of books that cover certain stories in more detail if one wanted more info. 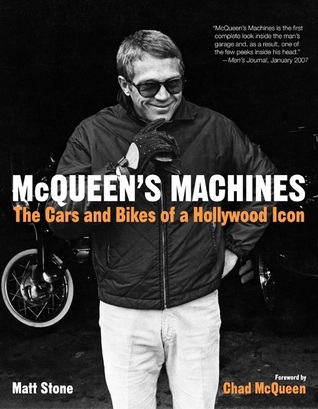 One bonus is the book has lots of great old photos of McQueen and his various machines. 3.5 stars. Ok, time for honest admission. While I normally review works of Christian theology, spirituality or hermeneutics, with the occasional novel or children's book thrown in, I am a car guy. Since first seeing Bullit as a pre-teen, I've also been a fan of Steve McQueen...well, particularly his motoring tastes and how that usually makes its way into his movies. I always respected the fact that he was a true driver and that it wasn't just an on-screen persona. If you are a Steve McQueen fan, 3.5 stars. Ok, time for honest admission. While I normally review works of Christian theology, spirituality or hermeneutics, with the occasional novel or children's book thrown in, I am a car guy. Since first seeing Bullit as a pre-teen, I've also been a fan of Steve McQueen...well, particularly his motoring tastes and how that usually makes its way into his movies. I always respected the fact that he was a true driver and that it wasn't just an on-screen persona. Steven McQueen was one hellofa guy; he loved, understood, and was good with engines. If you're looking for a biography, look elsewhere. If you're looking for a book on his cars, motorcycles, racing, stunt driving, collecting and so forth, this is your book. Nice intro by Chad McQueen whose input is felt throughout. Chad even let Stone drive some of Steve's cars including the '58 Porsche speedster and the '67 Ferrari NART spyder. Lots of fab pictures of cars (and McQueen) that remind you why you Steven McQueen was one hellofa guy; he loved, understood, and was good with engines. If you're looking for a biography, look elsewhere. If you're looking for a book on his cars, motorcycles, racing, stunt driving, collecting and so forth, this is your book. Lots of fab pictures of cars (and McQueen) that remind you why you want to buy fast and pretty cars. Read on the Kindle app, which was new to me. Lots of techie information, and car and bike photos. Unfortunately, I could not zoom into the photos to get a better look, so I would recommend a hard-copy. This is not a book about the man, so much as it is a book about a man, his passion for vehicles and driving/racing them. Brought this as a gift for my husband who loves his cars and found myself enthralled again by the beautiful images of Steve McQueen a good present for the men and a good present for women who like to see the original eye candy ! Steve McQueen was great during his time. I can remember watching him weekly on "Wanted Dead or Alive." He was a man's man. I thoroughly enjoyed reading about his cars and motorcycles. It brought back many memories. The best auto collection book I have ever seen. Each and every vechicle he owned is cataloged. 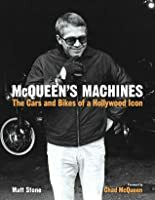 A very unique book for collectors, McQueen officianados, car and motorcycle enthusiasts alike. 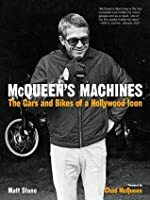 Fun reading and inspiring as a motorcycle owner and McQueen fan. It's McQueen. It's gorgeous cars and motorcycles. What's not to love? Nobody was cooler than Steve. Check out this great book. Steve McQueen's cars, just like him, epic.